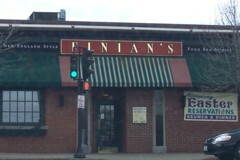 We went to Finian's in Quincy last night for dinner. I've been to Finian's several times, enjoying their comfort food and mixed drinks (Finian's is a bit like what Amrhein's in South Boston used to be before they changed last year). This time, however, my macaroni and cheese entree (a special for yesterday) was overcooked, mushy, and not very satisfying. While we were getting ready to pay the bill, a person who must have been the owner came over and asked how our meal was. We told him about the mac and cheese, and without hesitation, he graciously said he would take it off the bill. Even if they hadn't done that, I would still continue to go back to Finian's, since last night was an aberration, in my opinion. But the swift action he took cemented that fact, and should be a lesson to all restaurants: If a diner has a bad meal, do whatever it takes to make that person happy. In my previous experiences, this has not always been the case, but it should be, I believe. I agree they have great comfort food. However, my wife and I know the place simply as "that place with the worst coffee". We've had coffee there a few times, and it was the most watery brew ever. The first time, they even made a new pot, and it was exactly the same. "Me and my family just got back from there and it was the worst I have ever experienced. The fact that you have to wait, and see a lot of empty tables that just need to be douched in order to get another family seated is just the beginning. Its under NEW ownership, they have less room in there/ Scratch ticket machine, ATM, candy machine, not enough room to wait anymore. It's Fathers Day, brunch time buffet, i got my daughters food and then went to get mine and then my wife got hers and we waited ten minutes to get our coffee and juice. You get 2 juices each, and the juice was like tang or sunny delight, The food was cold, they didn't even have sausages. We didn't even know who our waitress was. I had to ask the manager for coffee. The manager got my 3 yearold daughter a setting and put a steak knife in front of her .I saw another family ask another waitress to get their waitress to get them some more coffee. i didn't even get asked if i wanted anymore coffee when we realized who our waitress was. A customer even got me a napkin.I told my wife at the END of it all "You are in charge, you do whatever you want when you go pay them," we got our bill and it said $40 something, our daughter just turned 3 and barely had a bite to eat, we told our "waitress"/ she took my daughters portion off. and the buffet went up 3 bucks since new ownership. Me and the Lil one went out and went into block buster, my wife had a discussion with the manager and told him of our experience, and she said we will never come again, he said " the waitress was just overwhelmed with the day" and come to me directly next time we come, she said"we will never come again". It's too bad, the previous owners were just very nice people and they respected their customers it was all in order when they owned it. Even some of the waitresses have left there because of the way that it is run. They lost some great customers, we are not the extra fussy/hard to please type people either. We just want to enjoy a nice meal without a headache and we had a migraine when we left. My wife didn't even leave a tip."